Server Folders Import & Sync. Tired of The Admin UX? there’s An Alternative! 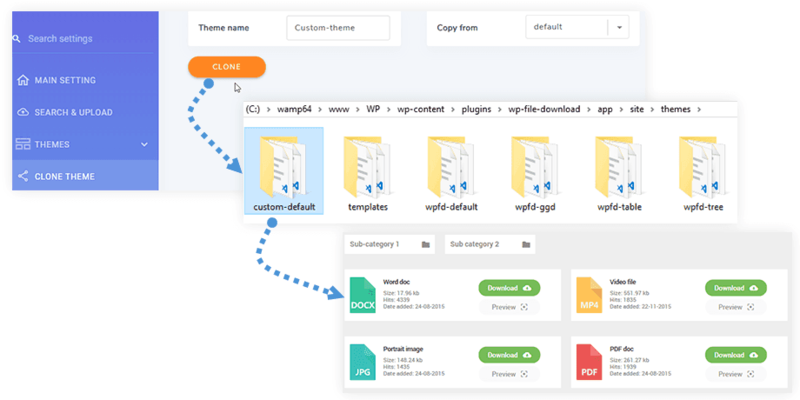 WP File download is a file manager for WordPress that is very flexible and easy to use for webdesigner and final users. 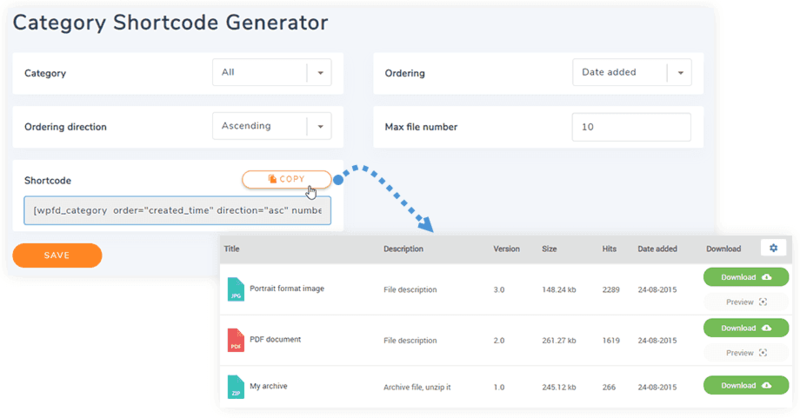 All files and category of files can be managed from your editor with AJAX ordering and auto saving features. The plugin includes 4 themes, with icon set and different display rendering tested on the most famous WordPress theme providers layouts. WP File Download includes 4 themes by default, each theme have it’s own configuration. 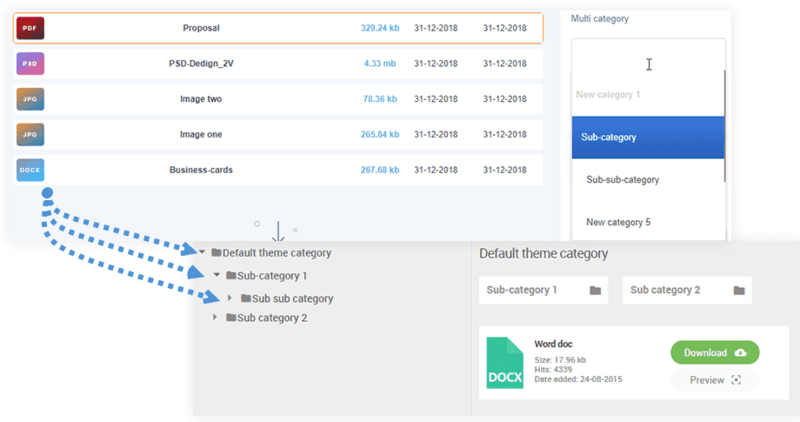 The theme system is very flexible because you can choose a theme per category of files and override each parameter in the category. Setup the download button color, info display, save and you’re done! WP File download can really fit your WordPress theme design. Want to create your own theme? you can do that in one click from the plugin configuration. Name it, clone it from an existing theme and you’re done! The new themes files will remain in place on plugin update. If you disable it, there’s a system to make an automatic fallback on the default theme. 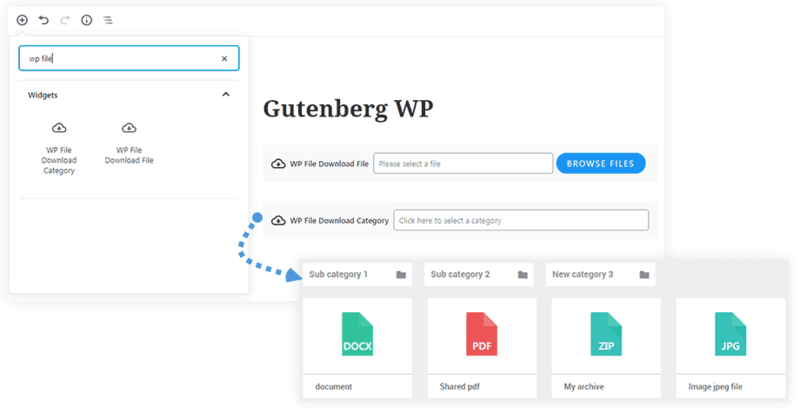 WP File Download has 2 dedicated Gutenberg blocks to search and insert files categories and to search and insert files in your Gutenberg pages. The admin file management has been fully designed to be easy to be used from anywhere. Whether you are in a post, page, in the plugin admin entry view, on mobile, you can manage your WordPress files the same way. It’s pretty easy to move and order files and categories, don’t lose your habits it works like WordPress nested menu. 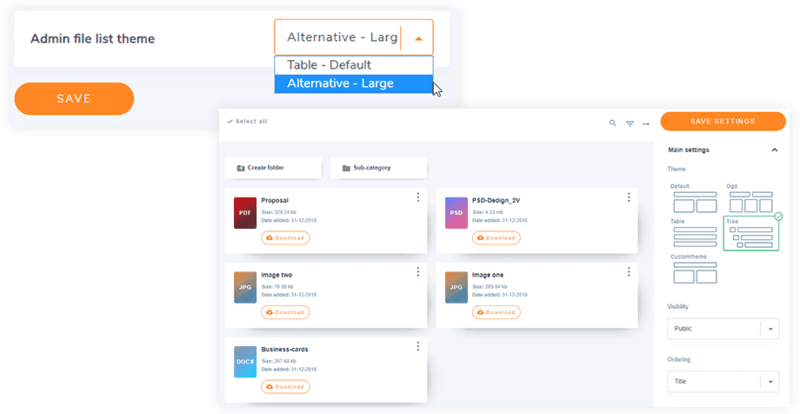 Drag’n drop files or categories, it’s automatically applied and saved. The Copy/Cut/Paste is very easy to use, it’s exactly like on your desktop, select one or several files, drag’n drop it + Using the MAJ keyboard will do a copy. You can also use the copy/cut/paste buttons. The public side is the most important for clients as file managers are usually not very user friendly regarding file category navigation. WP File download now offer an AJAX navigation through categories of files. Plus you have the possibility to activate a clickable breadcrumb + a side folder tree navigation. Each of those elements can be activated globally or per category. Access limitation can be set in each category in a WordPress native way. It means that it uses WordPress native user roles to define access. In each category you can allow only particular group to display and manage a category of files with a single click. You can also limit the file management to a category per user (manage its own files). For example, you can allow to only edit their own category of files so they won’t mess up with all your files. 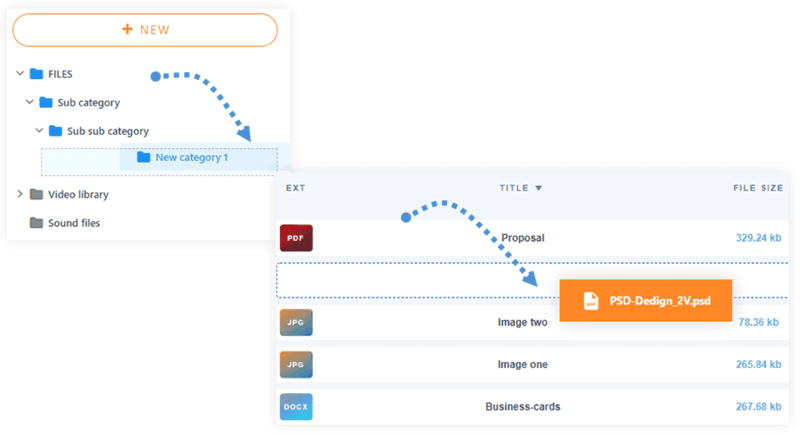 Using a shortcode you can simply include in your content an upload form to a predefined file category. You can limit the file or file category access to one or several users. Select a category of files or a single file, pickup one or several WordPress users from the list and they’ll be the only one to see the file. Each file have the option to belong to multiple categories without copying it, just select the categories where you to load it and you’re done. Then, editing the original file will update all the file mirrors. WP File download allows to manage multiple files in multiple nested categories. And what about single file management? You won’t need to do the work twice! You can use any file already uploaded and insert it where you want. Plus, you can design the color single file download button to fit your WordPress theme. 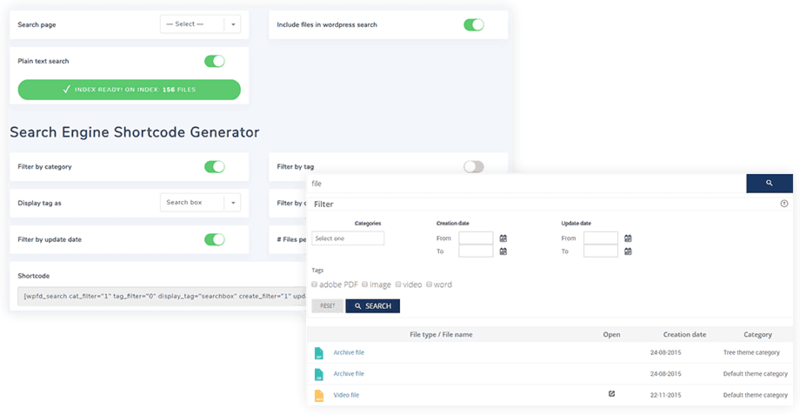 A file search engine and filtering tool is available from the parameters. 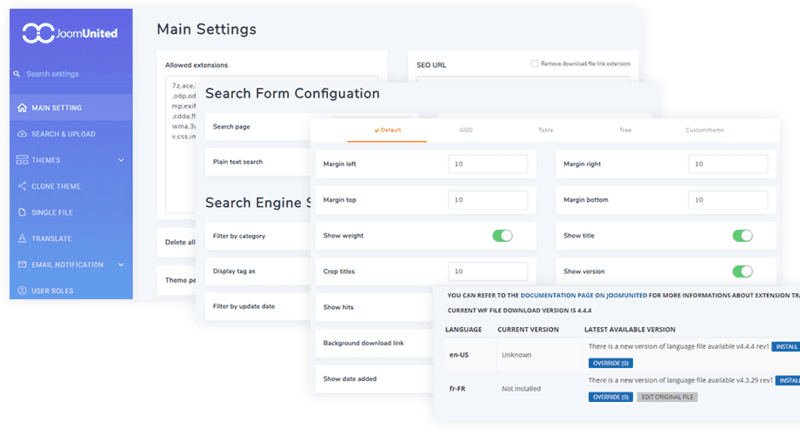 You can customize the options you want and generate your own shortcode, with the possibility to insert several search engines with different configurations. The following options and filters are available. File update is really a common and repetitive task you’ll be facing using a file manager, so it has to to be easy and fast to save time. We’ve included a file update button to simply replace an existing file in one click. Everything else will remain in place (description, version…). Each time you send a new version of a file online, the old version is stored and can be restored in one click. WP File download got an inbuilt file importer. Activate it, select files from your server on one hand, on the other hand select a file category and click on import. As an option, you can allow users to download all files from a category as a global .ZIP file. WP File Download is compatible with all the major page builders on the WordPress marker, admin and frontend page builder: Gutenberg,Visual Composer, DIVI Builder, Beaver Builder, ACF, Site Origine, Themify builder and Live Composer. WP File download can make remote download (add a distant downloadable file remotely, not hosted on your server). Setup a file name, description, URL of the remote file and insert it anywhere in the file manager. 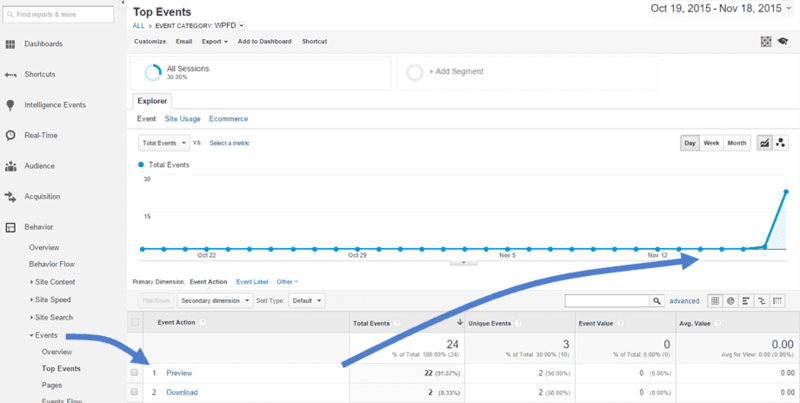 If you’re using Google Analytics on your website, you can track download and opened files (when a file is previewed). This is very simple as everything is automatic, in your analytics dashboard under the section: Behavior > Events you’ll see 2 new events “Preview” and “Download”. If you’re managing few files, it can be useful to get the files displayed in a more comfortable format. You can activate an alternative large display mode from the plugin configuration.